If the readership of insidegnss.com news is any indication, 2011 was the year of LightSquared. Articles about the would-be wireless broadband company that wants FCC approval to set up a terrestrial network transmitting on frequencies next door to GPS and other GNSS L1 signals garnered the most page views on our website for 6 out of 12 months. Only such matters as Wikileaks, a Supreme Court case, the Compass/BeiDou ICD, or Galileo’s first IOV launch could break the spell of the continuing LightSquared vs. GPS saga. We reprise those popular news items below. January 16, 2011 – OHB-System AG, builder of Galileo navigation satellites, has issued a statement from its chairman denying a WikiLeaks report that the German company’s CEO had told U.S. embassy officials that the European GNSS program was a "stupid idea" and "a waste of EU tax payers money. January 30, 2011 – In his State of the Union address on January 25, President Obama held up the Global Positioning System as a prime example of government providing "cutting-edge scientists and inventors with the support they need" to create world-leading, job-creating innovation. March 16, 2011 – Yesterday a working group mandated by the FCC waiver to address the potential LightSquared/GPS interference issue delivered its first monthly report required by the FCC. 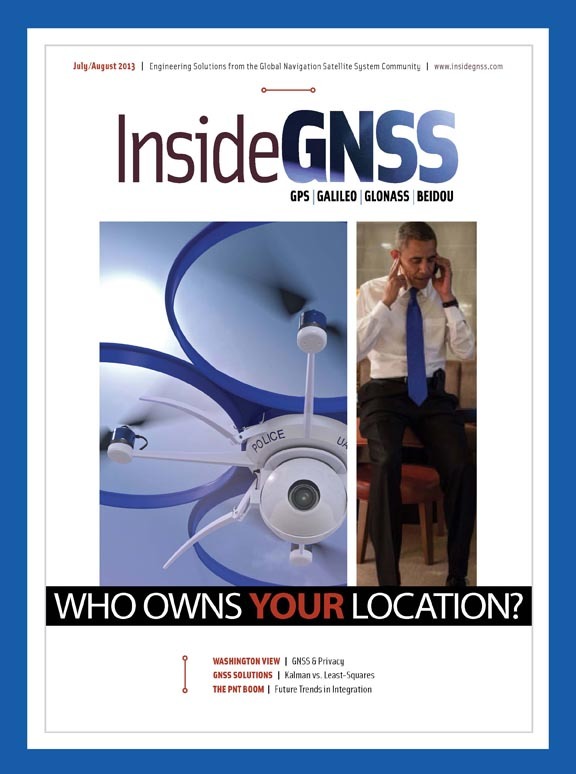 April 16, 2011 – On April 15, 2011 the Obama administration asked the U.S. Supreme Court to take up the question of whether prolonged police surveillance using GNSS-aided tracking of a suspect requires a search warrant under the provisions of the Fourth Amendment to the U.S. Constitution. April 30, 2011 – In between partisan confrontations around the 2011 federal budget and raising the U.S. debt limit, prospects are improving for federal legislation that would provide the Federal Aviation Administration (FAA) with a regular full-year budget for the first time since Fiscal Year 2007 – including support for completing the transition to a GNSS-driven air traffic control (ATC) system known as NextGen and a "public-private partnership" to equip aircraft with the needed avionics. May 28, 2011 – Tests of GPS receiver vulnerability to transmissions from terrestrial base stations in the proposed LightSquared 4G/LTE broadband service were scheduled to wrap up on May 27, but results as we post this message clearly indicate substantial adverse effects on GPS user equipment. July 1, 2011 – LightSquared submitted a 318-page report to the Federal Communications Commission (FCC) yesterday on the months-long effort of a technical working group (TWG) to investigate the effects of the would-be cellular broadband company’s terrestrial transmitters on GPS receivers operating in an adjacent RF band. July 29, 2011 – Having apparently exhausted themselves debating a subject that a majority of Americans considered a non-priority – raising the debt ceiling – the U.S. Congress adjourned for summer recess on August 1, automatically cancelling two House hearings (discussed later in this article) that had been scheduled on the LightSquared/GPS interference issue. September 15, 2011 – Amidst a storm of political controversy and the conspicuous absence of a key administration witness, Department of Defense (DoD) officials told members of Congress today that a proposed broadband wireless service would degrade or render useless billions of dollars of equipment essential to military operations. October 14, 2011 – Launch of two Galileo in-orbit validation (IOV) satellites next week will bring Europe’s long-awaited (and much-delayed)GNSS program into a new phase. November 17, 2011 – No sooner had GPS positioning helped validate key aspects of Einstein’s general theory of relativity in the Gravity Probe-B program than GPS timing has been cited as helping bring his special theory of relativity into doubt. December 2, 2011 – China launched its 10th Compass/ BeiDou-2 GNSS satellite this morning. This is the third Compass satellite launched this year and the fifth placed into an inclined geosynchronous orbit.